We offer a wide variety of share houses (guest houses) for women of all ages and occupations. Some houses have tenants from overseas. Each house has different characteristics and features. Just off Araiyakushi shopping area. Located in an old-fashioned district. Located only a 10-minute walk from Roppongi station and 5-minute walk from Roppongi Itchome Station but nestled in the leafy suburbs, you won’t even realize that you’re just a stone’s throw from Tokyo’s liveliest international area! Roppongi is also known for its high-end shopping malls, trendy restaurants, vibrant nightlife, and scenic urban spots such as Roppongi Hills and Tokyo Midtown. With a minimal and monochromatic interior, this newly renovated share house is equipped with all brand new furniture, appliances, and includes free wifi. Happy House Kagurazaka is located right in the heart of Kagurazaka, known for both its global, modern and traditional shops as well as the famous hilly, cobblestone streets, giving it a Kyoto-like charm. This share house gives a nod to its surrounding area with its elegant, boutique decor and touches of neutral wood. With a small capacity only holding three private rooms and two dormitories, the environment is cozy, intimate, and bright. Located a 5-minute walk from Kagurazaka Station. Located in the quiet, residential area of Yoyogi with quick access to Tokyo's beloved Harajuku and Shinjuku, Witt-Style Yoyogi is a natural haven for lovers of a calm and slow-paced lifestyle. With the natural design accents and warm hues, this share house's atmosphere is perfect for relaxation despite being in Tokyo's center. 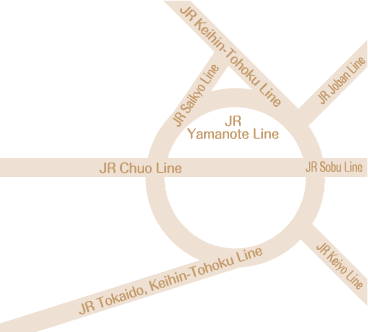 Nearby are major shops including Shinjuku Takashimaya, Tokyu Hands, Kinokuniya Bookstore, and much more. Make use of the large rooftop terrace for reading, meditating, or enjoying some drinks on a warm, summer night. copyright Tulip Real Estate Co., Ltd.All rights reserved. Tulip Real Estate Co., Ltd. Unauthorized copying of images prohibited.